You can now easily configure Sitecore Items for Scheduled Publishing using Sitecore PowerShell Extensions. PowerShell has a great Power. It saves developer life a lot by providing the way of Integrated Scripting Environment and without Web Deployment, you can execute the script on the different environments easily. On date-time arrival – once the scheduled task is executed the script will start publishing items if the values are selected properly. Make sure item is not in workflow and is allowed to publish, otherwise it won’t be published. Schedule Items_DD-MM-YYYY — This is just a sample item without properly selected values. You just need to add the values properly and Enable the checkbox for publishing at Scheduled Time. 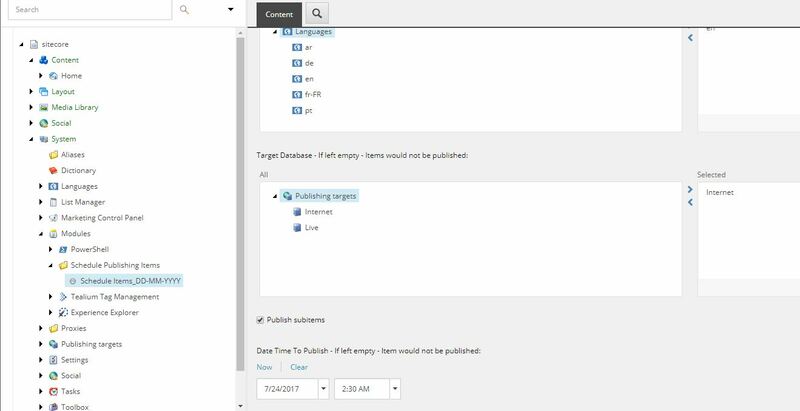 There is an option to disable an item or delete an item once publishing is done so that it should never process next time when the scheduler looks for the scheduled publishing task. If you do not select to disable an item after publishing is done and do not select to delete an item then it will execute every time the scheduler check for schedule items to publish as the time is passed away. Note: The script will execute, once the scheduler starts scheduling jobs. The default time is 10 minutes, so every 10 minutes system will check for scheduled publishing. Therefore, while setting the time you need to be aware of the scheduled task execution time. Refer below in your config. If you have changed the value then it will work accordingly. 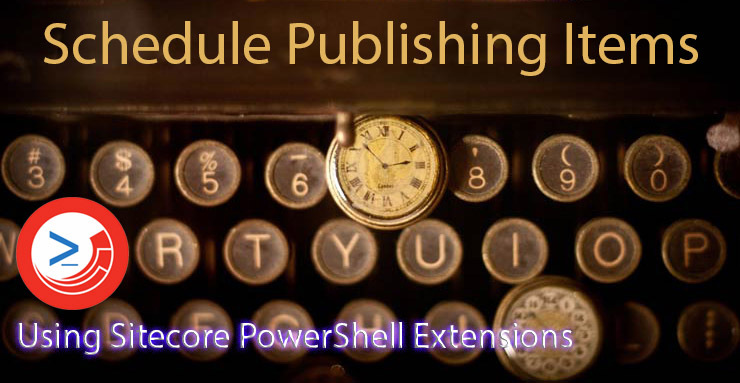 PowerShell will to your scheduled publishing. And you can enjoy your weekend. This might be the case for your requirement, first Export Sitecore Items, then it could be Update Sitecore Items in bulk and then I’m sure there would be the third one to Publish Sitecore Items in Bulk. 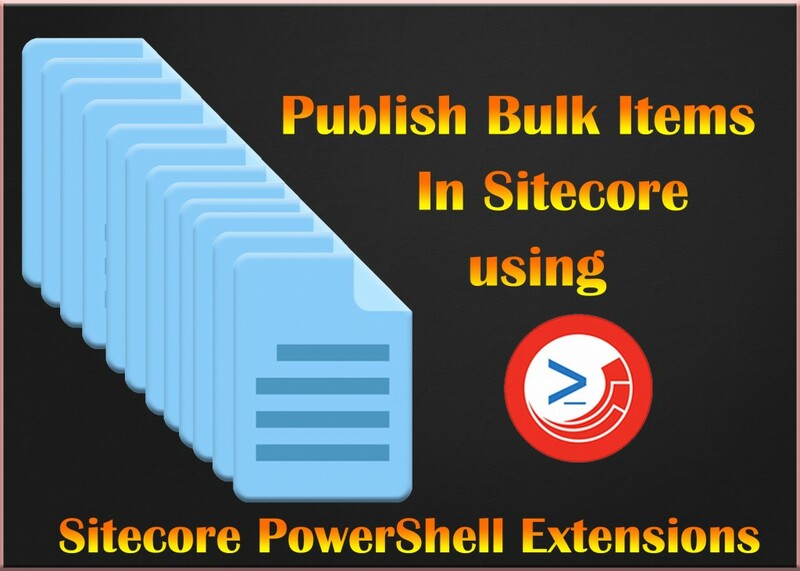 I’ve written Sitecore Powershell script which would do the job easier. In Update Sitecore Items — I provided the sample file, the same file you can use for Bulk Publish. Below script will first ask the user for the CSV File. Then it will ask for Target Database to publish Sitecore Items — The reason for providing this option is because every Sitecore site have the staging environment and it’s always better to verify the changes. So you can accordingly select the target database and after verifying you can push it Live. Once processing is done file will be deleted. Publish Mode is set to Smart. Note, Sample CSV File has two important columns which are required by this script, ItemPath and Language — Items will be published in the provided language.